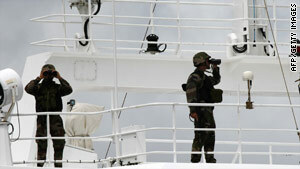 Security efforts have targeted piracy in the waters off lawless Somalia. United Nations (CNN) -- Pirate attacks off Somalia's coastline have "grown exponentially" in the past five years, but pirates are claiming fewer ships these days, according to the U.N.-backed European Union naval operation tackling Somali piracy. But according to Paul Chivers, chief of staff for the EU's Operation Atalanta, "We cannot assume that the threat of piracy has been overcome. ... We need to be careful of complacency." Most of the ships not targeted by pirates are "almost exclusively those that have best management practices" in place, Chivers said Thursday. Best practices include "registering your ship ... where it's going and its route." It also includes self-protection measures designed to prevent pirates from getting on board, such as barbed wire, pieces of wood at ship entries, charged fire hydrants and zig-zagging courses for ships at sea. "Most of these things, besides barbed wire, are found on ships" Chivers said. "The more a ship is able to deny pirate entry onto their vessel, "the quicker we can get a warship or helicopter to them," Chivers said. Up to 75 percent of ships do comply with best practices, but "the challenge is the ships that do not," said Carl P. Salicath, senior advisor at Norway's Ministry of Foreign Affairs and chairman of a U.N. group focused on Somalia's piracy problem. The number of successful attacks has gone down since the "best practices" strategy was implemented. Last year, 47 ships were hijacked by pirates, less than the year before. The government of Norway has expressed expectations to establish an international fund to support counter-piracy measures. "A good number of countries have already pledged money ... including Norway," Salicath said. A two-decade-long civil war has left Somalia largely lawless, providing fertile ground for piracy to go unchecked. The U.N. is now bringing its focus on Somalia's ability to deal with piracy. "We've got ideas," Salicath said, "such as establishing a Somali coast guard, but they're only ideas, they still need to be elaborated upon."